Last week, hundreds of thousands of women’s health advocates, including Breast Cancer Action members, took action to put women’s health before politics or corporate interests. Change happened because we demanded it. 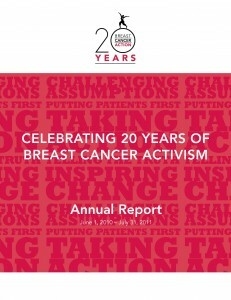 At this moment, in the history of breast cancer activism, we are particularly proud to share with you Breast Cancer Action’s 2010–2011 Annual Report in which we celebrate the many achievements you made possible. Over the last 12 months, you’ve protected patients’ interests, decreased environmental links to breast cancer, advanced our work to address health inequities, and provided essential education and referral services to women across the country. Through our Milking Cancer and Think Before You Pink® campaigns, you challenged pinkwashers and mobilized hundreds of activists to take action. We also bid farewell to our founding director Barbara Brenner after 15 years of fabulous leadership. Barbara, the strong foundation you helped create inspires us all to continue speaking truth to power to end the epidemic. And even as we take a brief moment to celebrate the accomplishments we’ve had together, we know our work is far from over. We are committed to challenging the status quo and creating systemic change to address and end the breast cancer epidemic. Thank you for your generous financial support and fierce activism. P.S. Keep your eyes on your inbox next week because we have a change-making tool made for you. We look forward to building on recent momentum to change the status quo of breast cancer together.